STEP 1 Please make the connection according to the diagram on the right. Click the diagram to enlarge it. 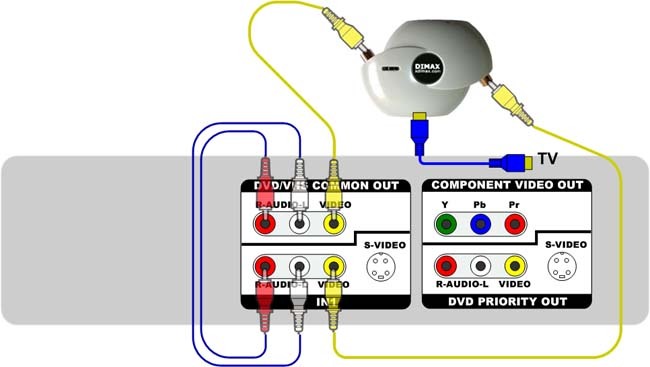 STEP 2 Place DVD disk media into DVD Recorder and Source Video Tape into VCR. STEP 4 Press Record. 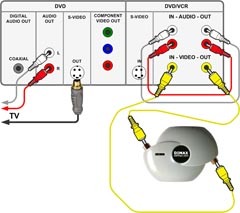 DVD Recorder must start recording from INPUT1. Do not use DUBBING button! STEP 5 Right after the DVD recording started switch to the VCR mode and press play. VCR should start to play the Video Tape you are recording from. STEP 1 Using DRIVE SELECT button on remote select DVD mode. The DVD indicator on front panel will light up. Put the destination DVD media into DVD drive. 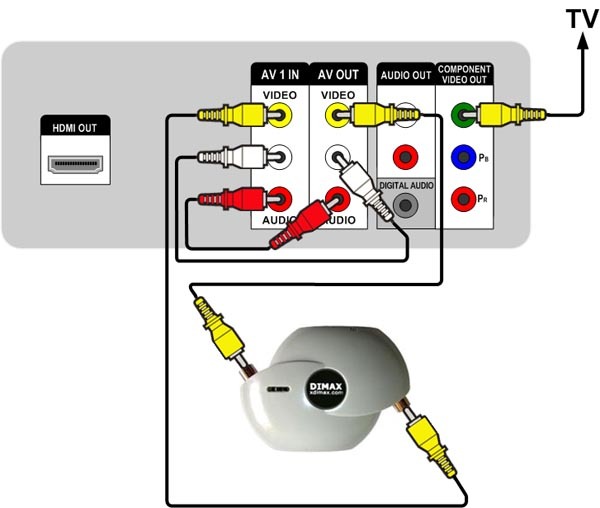 With INPUT SELECT button on remote select IN1. The IN1 should appear on the front panel LCD. STEP 2 Make the hook up according to the diagram on the right. Click the diagram picture to enlarge it. 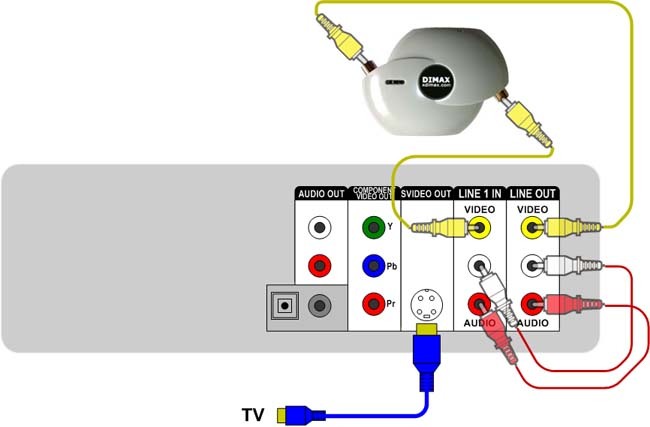 The only way to monitor recording on TV is to connect Grex S-Video output to TV S-Video input. STEP 3 Put the source VHS into VHS drive and position the tape to the point you want to start the recording from. Stop VHS where. Grex light indicator in this period should be steady or fast blinking red. STEP 5 When you will need to stop recording press STOP in VHS mode. This will stop VHS playback. Switch to DVD mode and press STOP. This will stop DVD recording. You will see the message "Writing the information on the disk..." for a few time. Now you can play the recorded video. You may need to finalize new DVD if you are going to watch it on another DVD player. Because of the loopback connection picture on TV in steps 3,4,5 may be smeared. But while recording in progress (step 4) you should see the recorded video clear. 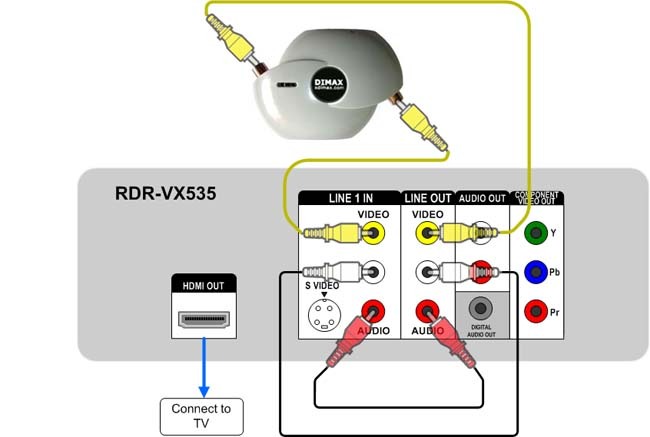 STEP 1 Select VCR mode with VIDEO button on remote. You should see VIDEO indication on front panel. Put VHS into VCR drive and position it to the place you want to start recording from. Stop VHS where. STEP 2 Select DVD mode with DVD button. Get DVD indication on front panel. Put the destination DVD media into DVD drive. With INPUT button on remote select LINE1. STEP 3 Make the hook up according to the diagram on the right. Click the diagram picture to enlarge it. Switch to DVD mode and press STOP. This will stop DVD recording. You will see the message "Updating the information of disk..." for a few time. 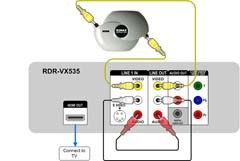 STEP 1 Select VCR mode with VCR button on remote. Put the VHS into VCR drive and position it to the place you want to start recording from. Stop VHS where. 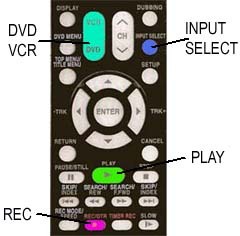 STEP 2 Select DVD mode with DVD button. Put the destination DVD media into DVD drive. With SOURCE button on remote select E1 REAR input. Make sure input is configured as COMPOSITE. To check it press SETUP and select General_Settings -> Video -> Video_Input -> E1(Rear) -> Video_IN. Switch to DVD mode and press STOP. This will stop DVD recording. You will see the message "Writing to disk ...%" for a few time. 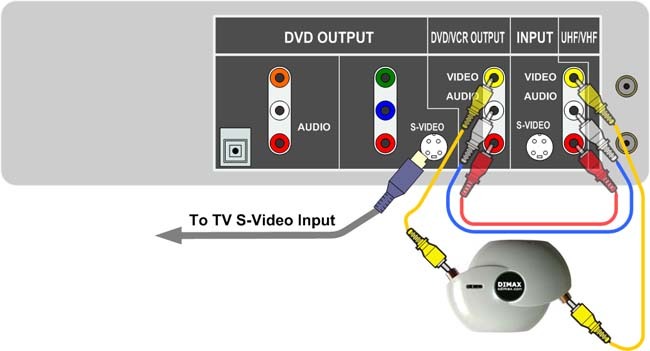 STEP 1 If your TV has component video input connect Samsung Y,Pb,Pr into corresponding TV Y,Pb,Pr inputs. Otherwise connect Samsung Y into TV composite video input. In this case you will get black and white picture. This is normal. STEP 2 If your TV does not support 100Hz video you will not see stable picture. To fix it, disable progressive scan in Samsung. Go to SETUP--->Video--->Progressive--->OFF. STEP 3 Make connection shown on the diagram. STEP 4 On remote control press "DVD" button and then press "Input Sel." until you see AV1 on VR375 lcd display. Recording Put DVD media into DVD driver and VHS into VCR driver. Select DVD pressing "DVD" on remote. Press "REC". Select VCR pressing "VCR" on remote. Press "PLAY". Now recording from VHS to DVD is in progress. You should see playback on the TV.